Nice post Sarah. When it comes to global warming, your basic point is completely true. Because CO2 stays in the system for a very long time and because the ocean takes a very long time to warm up, much of the warming is not yet realized from the emissions already in the atmosphere – that is, even if we stop emitting any greenhouse gases at all now, we still have quite a bit more warming to go. And for the same reason, the temperature of the planet now is largely a function of emissions past. But the graph you show actually is potentially misleading in this respect. 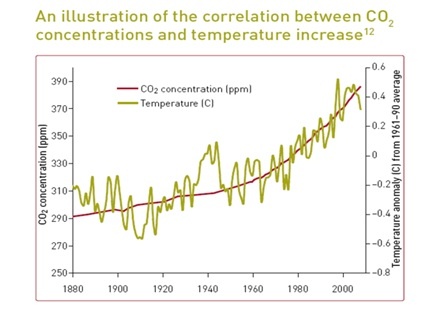 Since the units are chosen so that the two curves lie on top of each other, it seems to imply that the CO2 concentration now and the temperature now are uniquely and instantaneously related, which isn’t true. It seems to contradict what you are saying, but it doesn’t and you are right.